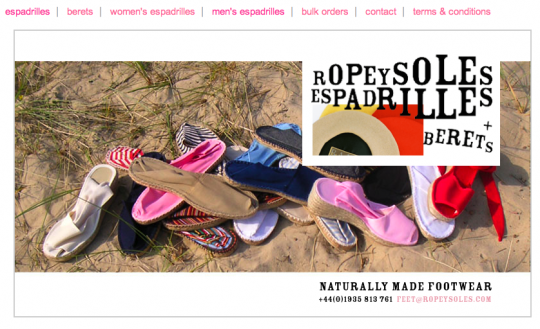 I’m pleased to be able to announce a new partnership with Ropeysoles Espadrilles and Berets, an online purveyor of … espadrilles and berets, two of my favourite accessories. For new readers, you’ve not run across my obsession with the rope soled shoes. 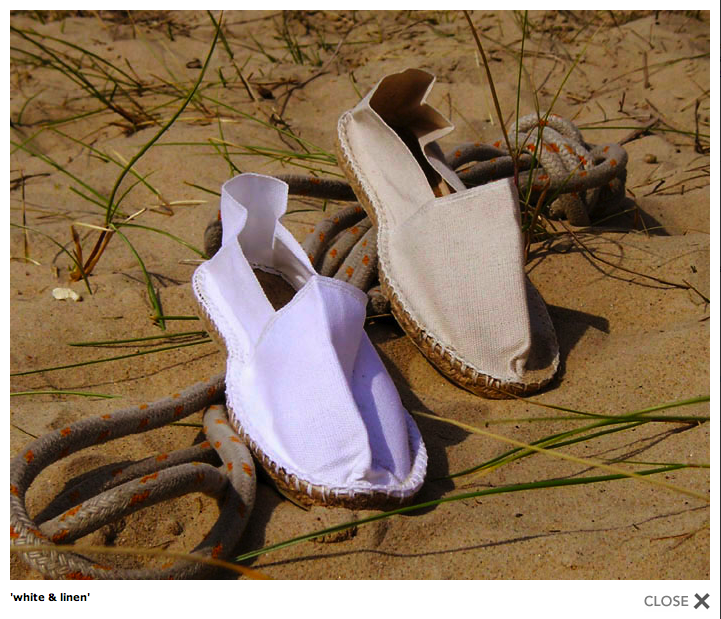 In summer they accompany me to the beach and as soon as the weather warms in spring, they become my house slippers and general kick-around shoes. I prefer them in stripes and plain white. And is there anything more chic to wear with your black maillot, aside from a St Tropez tan and a large brimmed straw hat? I think Mrs. E. might like these in black or marine. The prices are the best I’ve found on the internet and Ropeysoles has generously offered readers of Easy and Elegant Life an additional 5% off each order. Because of their existing discount mechanism for 4 or more items, that 5% will be applied after the existing 10%, so you get 14.5% off on any order of 4 or more items in any mix. Just enter EE2010. It’ll tell them I sent you. 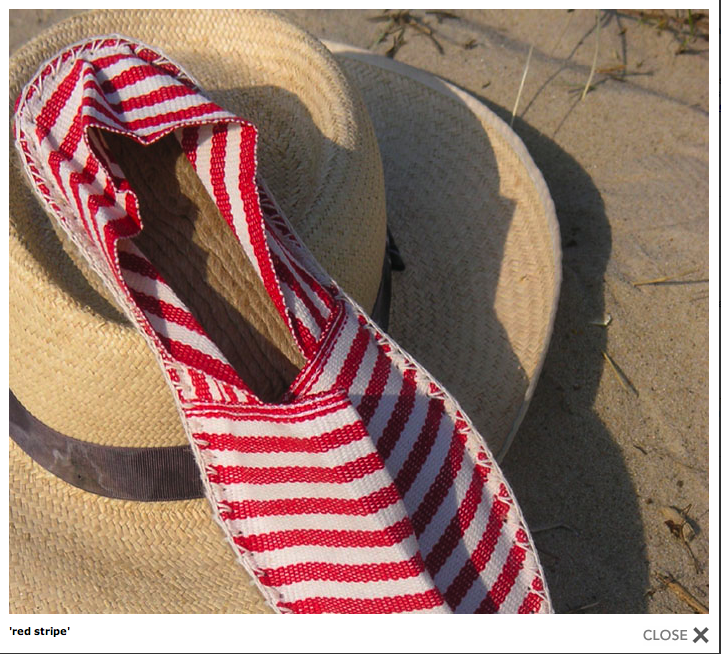 This entry was posted in Elegantology and tagged Bain de Soleil, Espadrilles, Ropeysoles.com, summer shoes. Bookmark the permalink. These are so wonderful for spring and summer. Thanks for sharing Chris! Mr. Lane, I should’ve taken a picture. It goes nicely with my Barbour in the rain (my Basque boina sheds water like a duck) and my camelhair polo coat. Mary, send an email and ask after your size. They are very courteous with replies. Yes, Toad is right. Don’t leave toe room like you would for ordinary shoes. A propos the discussion about berets – they are excellent misty and drizzly weather wear, which is why hunters love them. And in the Basque country you’ll still see young blades wearing them to strut their stuff, matched with dark blazer, white shirt and a bow tie. Perhaps I should qualify my remarks about espadrille sizing. At RopeySoles, we made a big effort to ensure that our sizes would result in an espadrille that fitted a foot that wore the same nominal size in ordinary footwear, but many people have feet that are in between two sizes, taking the larger or the smaller depending on who made the shoe – if that applies to you, you should order the smaller size. If you are in any doubt, why not draw round your feet, then scan the drawing with a ruler on the scanner bed at the same time? (That’s the only way to show dimensions – scanners don’t guarantee one-to-one scale). Then e-mail us with the scan attached.